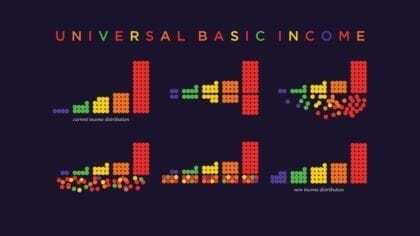 This essay was originally published on Basic Income News in February 2012. The resource curse, as I see it, comes in three different forms. Alaska has avoided the first two, but whether it avoids the third remains to be seen. The first-stage resource curse occurs when resource exports drive up the nation’s exchange rate and drive other industries out of business. The phrase “Dutch Disease” was coined to refer to this kind of resource curse. The second-stage resource curse occurs when the influx of cash from resource exports fosters corruption, graft, and sometimes dictatorship, so that all or most of the oil revenue is used against the people rather than for their benefit. The third stage of the resource curse occurs when the resource windfall creates temporary prosperity for all or most of the people, only to lead to depression and economic deprivation as soon as the resource revenue disappears. A large number of factors can contribute to the third-stage resource curse. It can happen if the resource-exporting community invests in an infrastructure suited only to resource exports and is either too large or the wrong kind of infrastructure for the economy that will need to be in place when the resources are gone. Probably the most important reason for a third-stage resource curse is too much spending on immediate needs and not enough savings. The first two forms of the resource curse will be apparent during the boom, and clearly Alaska has escaped them. But we cannot know for sure whether it has escaped the third stage until the resource is gone. How well is it doing to avoid the third-stage resource curse? Three strategies to avoid this third kind of resource curse are savings, investment, and the hope that resource revenue will never end. Although Alaska oil production has been slowly and steadily declining for twenty years, the hope remains that natural gas, newly discovered oil reserves, or some other resource discovery will replace what is being lost. This hope will never die, but it can substitute for cautious preparation. Alaska has made some good investment spending on schools and infrastructure, and it has managed to save some money. According to Commonwealth North, Alaska has saved $66 billion dollars: about $40 billion in the Alaska Permanent Fund (APF), $10 billion in the Constitutional Budget Reserve (CBR) and the rest in other funds and saving mechanisms. Compared to most other U.S. states, struggling with budget deficits, these saving figures are impressive, but they’re not as impressive compared to other resource exporters. After exporting similar amounts of oil, Norway has amassed a fund of $560 billion dollars. Instead of saving the bulk of its oil revenue, Alaska has devoted almost all of it to current spending. This decision has put Alaskans at risk of the third kind of resource curse. If the state government had to draw on the interest of its savings to make up for a shortfall in oil revenues, all the funds together could not be counted on to cover even one-fourth of the state’s annual budget, and most of the interest on Alaska’s savings (after inflation-proofing and reinvestment) is already rightly dedicated to paying dividends. If and when oil exports come to an end, Alaskans will need and deserve the returns to their savings more than ever. The Alaska Permanent Fund (APF) and Dividend are working just as intended. They are Alaska’s best savings plan. They constitute a model that other places should be following. When savings are most needed, the state shouldn’t abandon that model; it should build on it. If the fund was large enough, the interest on it could support both a substantial dividend and some or all of the state’s regular spending. The solution for Alaska is to save more money now, while oil prices are high and production is healthy and to treat more of its resources the way it treats oil. The state can’t save more for the future without making some sacrifices in the present, but I want to show you that a much larger fund is feasible. First, let’s consider what might have been. When oil revenue started flowing into Alaska, one proposal was to save all of it and spend only the interest. Of course, we can’t change history now, but it is valuable to look back with the benefit of numbers that weren’t available looking forward. According to Gregg Erickson and Cliff Groh’s chapter in Alaska’s Permanent Fund Dividend: Examining Its Suitability as a Model, the state received a total of $103.5 billion in oil revenue by 2010 (adjusted for inflation). It invested $19.1 billion (18.2 percent of its oil revenue) in the APF. Most of the remaining $84.4 billion (81.8 percent) went to the general state budget. Even though the APF has paid 30 years of dividends, the principal has increased by a total of 217 percent to about $40 billion. Suppose, for the sake of argument, that Alaska had saved all of its oil revenue into the APF, using half of it for regular revenue and half of it for the PFD. If this larger fund did just as well as the actual fund has over the last 35 years, the APF would now be worth about $225 billion. It would have $9 billion available this year. Suppose it used half dividends and half for spending. If all 700,000 Alaskans applied for the PFD, $4.5 billion would finance a dividend of more than $6,000 per person, or more than $24,000 for a family of four. The remaining $4.5 billion dollars would cover about 43 percent of the current state budget of $10.5 billion. But this is not all that might have been. According to Erickson and Groh, oil produced in Alaska has generated more than $300 billion in total revenue, two-thirds of which has gone to oil companies. Although fees, royalties, and taxes on Alaska oil have recently been increased, they have historically been very low by world standards. Some nations capture as much as 80 percent of oil revenue. Even though the oil was discovered by state geologists on state land, and the oil companies were brought in only as hired help, the state has let the oil companies walk away with most of the profits. Had the state captured two-thirds of oil revenue instead of only one-third, and saved all of that, Alaska could now have an APF of $434.8 billion. It would have $17.4 billion available this year, $8.7 billion for the general budget and $8.7 billion for dividends. The share going to the state budget would cover 83 percent of state expenditure. The state would only need to raise only $1.8 billion in taxes to cover all other current spending. Assuming the population of Alaska remains unchanged at 700,000 (which is admittedly a very big assumption at such a large dividend level), every Alaskan would receive a dividend of more than $12,000 per year. Poverty would no longer exist in Alaska, and everyone, rich or poor, would have a large springboard for opportunity. The figures could be even higher if the state had treated more resources the way it treats oil, but I think you get my point. Even if the state needed to spend some of that money as it came in on badly need projects, it has much greater capacity to save than it has taken advantage of. It could have waited to get rid of the income tax until was replaced by permanent returns to the state’s savings (rather than temporary oil revenue). It could have driven a harder bargain with the oil companies. And it could have treated more resources the way it treats oil and mining. It would now little to fear from the coming decline in the oil revenue. We can’t change the past; where can we go from here? Alaska has increased taxes and fees on oil companies in recent years, and it needs to resist oil company pressure to reduce them. Several proposals on the table right now would increase the APF. Senator Johnny Ellis proposes moving $2 billion from the CBR to the APF, and Representative Mike Doogan proposes $10 billion. These proposals are a start, but it is not enough simply to protect some of the savings Alaska has accumulated. Alaska needs to save more — a lot more. The state government takes in about $9 billion in oil revenue per year. Suppose the state saved $8 billion of that each year for the next 10 years and its investments do as well over those years as the APF has on average in the past. If so, by 2022, that savings alone would accumulate to more than $90 billion. The APF would grow to $50 billion, or $62 billion dollars with Rep. Doogan’s additional $10 billion were moved from the CBR. Combining that savings would make the APF balance $152 billion. It would produce $6 billion dollars of returns ready for use. If all of that revenue were devoted to the PFD, each Alaskan would receive a dividend of more than $8,000. If half of it were devoted to the PFD, it would have $3 billion dollars per year of permanent income to relieve pressure on the state budget, and it would still be able to pay dividends of more than $4,000 per person per year. Such an ambitious short-term savings plan is probably not politically possible, but it is possible to move in that direction. Continuing to live off temporary revenue will leave the state vulnerable to the third-stage resource curse. Even $1 billion a year in additional savings would be a good start in protecting Alaska’s future.